The campaign hopes that consumers will take back control and demand an end to the use of animals as commodities and resources. The victims include the wild animals who are hunted and exterminated by this reckless, destructive industry, as well as the domesticated animals bred into existence for human use, confined (whether in crates or pastures), and ultimately killed so that people can make use of the products of their misery. Many people are becoming aware that the animal [agriculture] industry is destroying much of the natural world, as well as harming human health. Those who consume animals and animal products are casting irreversible ecological damage. 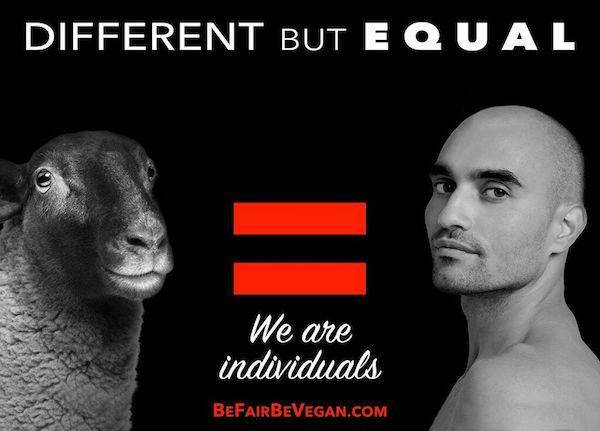 Asking someone to stop eating animals and to adopt a vegan way of life should no longer be viewed as an infringement of individual rights, since it is actually the other way around. A provocative campaign launched in New York calls for justice for animals, saying they feel emotions just like humans do. Rising above 1500 Times Square and the Jacob Javits Center in New York City stands the most ambitious animal justice campaign ever launched in New York. 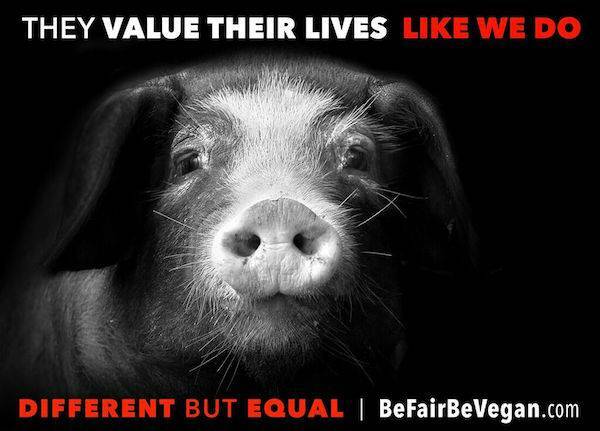 “Be Fair Be Vegan" introduces viewers to the sentience of animals by using evocative closeup images and powerful messaging demonstrating that other animals experience emotions just like humans do. For four weeks, the slideshows will be displayed in two of the highest profile billboard locations in the country, and will be accompanied by a series of 200 street posters throughout Manhattan. The campaign invites passersby to consider the circumstances of the victims of the animal production industry while seeing them for who they are: feeling, caring beings who value their lives and their families. The campaign is the brainchild of Joanna Lucas, a writer, visual artist and animal advocate. “We want people to consider their obligations to these often invisible animals, consider that they are sentient beings with complex relationships and lives of their own,” said Lucas, who created vegan outreach materials and campaigns for Peaceful Prairie Sanctuary, where she studied and chronicled the rich lives of animals who are commonly dismissed as food or objects of use. “Those who consume animals and animal products are casting irreversible ecological damage," said Richard Oppenlander, author of the book Comfortably Unaware. "Asking someone to stop eating animals and to adopt a vegan way of life should no longer be viewed as an infringement of individual rights, since it is actually the other way around.” Oppenlander, who serves as an adviser to world hunger projects, has spent 40 years studying the effects agriculture has on our planet and on humans. The first stop for the campaign, New York City, was chosen because of the sheer volume of foot traffic and the diverse cross-section of humanity that travel the city's streets. The movement has enlisted passionate volunteers and organizers, as well as Scout 22, the vegan marketing and PR agency I founded. Our goal is to spread this campaign to other cities. Launching this movement in NYC was strategic. What could create more of a buzz than to be front and center at Times Square? Veggie burgers and non-dairy milks have escaped the realm of substitutes primarily for people with dietary concerns and followers of vegetarian diets. Instead, the growing ranks of novel protein sources and potential replacements appeal to the everyday consumer, foreshadowing a profoundly changed marketplace in which what was formerly "alternative" could take over the mainstream. 2016 has also been marked the year of equality. 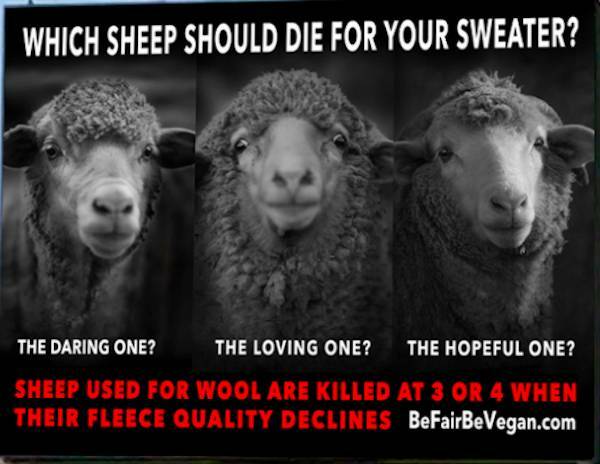 Be Fair Be Vegan believes the overwhelming violence in the world is a sign that we need to examine the root causes of our problems, including the disturbing nature of our relationships with non-human animals. Many people are begining to recognize that animals are no more meant to be our possessions than people with different colored skin, women, children, or any other living beings. 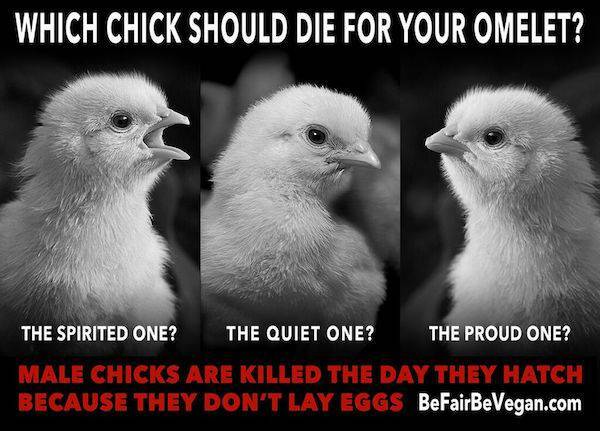 For more information, visit Be Fair Be Vegan and the Facebook page.